Multitude redux Empire: wrong way, don’t go back, we should leave too. People got wishful thinking a lot, and I am always for breaking the borders, but as this can be read from afar, I reckon yes, but the prognosis offered below by Hardt and Negri back in the Empire day ends up objectively anti-communist – the wrong side is lauded as abandoning the discipline of the system. What if rather, all the exploited under capitalism had pushed at the wall the other way, the former soviet block might not be a pit of cowboy corruption and proto-fascist gangsterism, but rather a renewal – walls can fall both ways, and maybe H&N were pushing the wrong way. I don’t mean everyone should now move to Mexico, but abandoning the shopping centre queues in favour of a Leninist discipline supporting an organised alternative to empty glitz is a long term better solution for all rather than this multitude exodus which does tend to me to sound a bit like Pol Pot’s year zero as well. Saibaba ‘given’ life = court takes life from a nice guy in awful #repressive state anti #maoist trumped up show trial. The wheelchair-bound academic was arrested in May 2014. He and five others were convicted under the Unlawful Activities Prevention Act. The District and Sessions Court in Gadchiroli, Maharashtra, on Tuesday sentenced Delhi University professor Gokarakonda Naga Saibaba and four others to life in prison under the Unlawful Activities Prevention Act. Besides Saibaba, the five people convicted under the draconian law are journalist and social activist Prashant Rahi, Jawaharlal Nehru University student Hem Mishra and tribals Pandu Pora Narote, Mahesh Kareman Tirki and Vijay Tirki. While five have been sentenced to life term in prison, the court sentenced Vijay Tirki to 10 years in jail, reported ANI. The wheelchair-bound academic was arrested in May 2014 after the Gadchiroli police claimed that he had links with Maoists and was “likely to indulge in anti-national activities”. Saibaba was granted bail in April, 2016. The Supreme Court had cited his medical condition – he suffers from 90% disability after being struck with polio as a child – and the fact that all material witnesses in the trial had been examined. On February 22, Saibaba had complained of chest pains and was taken to a local hospital, where he had been admitted to the Intensive Care Unit. He was said to have a pancreas infection, besides stones in his gall bladder stones. Doctors had recommended he have surgery in three weeks, after recovering from the infection. Between June 2015 and December 2015, he was out on interim bail for medical treatment. Saibaba’s family said they had been expecting an acquittal. “It is shocking,” Vasantha Saibaba, his wife, told Scroll.in. “There is barely any evidence against him – the trial proved this. We will definitely challenge the verdict.” She also claimed there was “state pressure” to have him convicted too. Saibaba had extensively campaigned against the Salwa Judum militia and the human rights violations that accompanied the Operation Green Hunt against Maoists launched under the previous United Progressive Alliance government. Our advocates will move High Court soon. This judgement is shocking. In the history of Maharashtra this is the first case in which all the persons charge sheeted were convicted in all the sections with life imprisonment. Saibaba’s brother attended most of the arguments of our advocates before the hon. judge and found that the judgement has not taken those into consideration. No evidence has been proved by the prosecution, electronic evidence not sealed. It seems the state and Central governments have put a lot of pressure on the judiciary to implement anti people and undemocratic policies at the behest of corporates and MNCs. The governments have selectively chosen to suppress the voice of people to plunder the resources of this country. The BJP govt. wants to push nakedly the agenda of RSS through such people like Saibaba behind the bars. The government has chosen this case through courts to silence the voice of Dr. Saibaba. By honoring the Court, Saibaba has been attending the Court all these years and today also despite his deteriorated health. As a wife, I will fight in the higher courts to seek justice. The government has been putting relentless pressure on my family for the last four years by raiding my house in Delhi. I appeal to Democrats, people’s organizations, intellectuals, students to condemn such undemocratic character of the government. After the pronouncement, judge has rejected to issue any order on the appeal of our advocate. Advocates asked to issue an order to direct the Jail authorities to give required medicines, help of assistants for Saibaba movement, operation to perform for gall bladder etc. The minimum requirements previous the Court has given when Saibaba was in jail as under trial are also not given. The Nagpur bench of Bombay High Court cancelled the bail of Delhi University professor G. N. Saibaba and asked him to surrender before the police by 25th December. 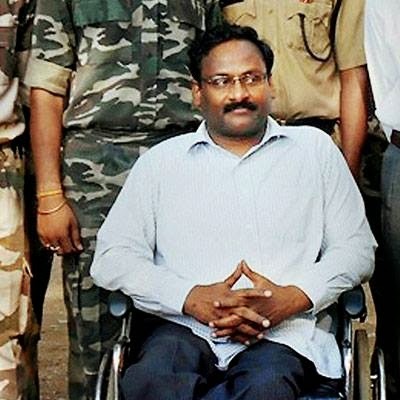 The Wheelchair-bound Saibaba who is over 90% disabled will celebrate Christmas in jail. A single judge bench of Justice Arun Choudhari also charged Author Arundhati Roy for criminal contempt for writing about Saibaba’s imprisonment and the court’s denial of bail in her article “Professor P.O.W.” in Outlook magazine in May. Arundhati Roy has to reply to the notice by January 25, 2016. 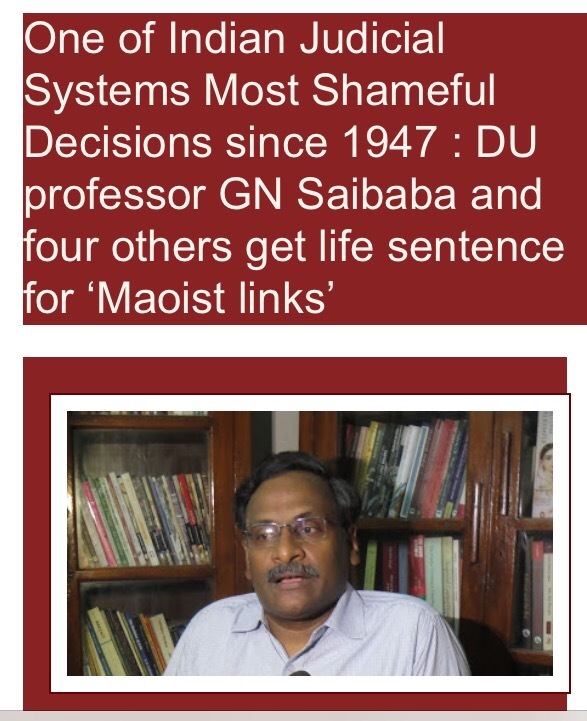 Prof. Saibaba was arrested by Maharashtra police in May 2015 for alleged Maoist links. On July 3, a two-judge bench of the Bombay High Court at Mumbai had granted Saibaba bail on reports that his health was deteriorated severely after 14 months in Nagpur jail. He has been paralysed from waist-downward since contracting polio in childhood. Since obtaining bail in July, Saibaba has been undergoing treatment at the Indian Spinal Injuries Centre in New Delhi. He had an angioplasty in August. The order canceling Saibaba’s bail says that there is sufficient material for the court to consider that the allegations made against Saibaba under the Unlawful Activities (Prevention) Act as true and thus, to cancel his bail order. It states that the Revolutionary Democratic Front of which Saibaba is a member, though not banned by the central government, “could be called as frontal organization of the CPI (Maoist)”. The order cites several pages of Roy’s article and notes that the article had a “mala fide motive to interfere in the administration of justice”. “Instead of challenging the orders passed by Sessions Court and the learned Single Judge of this Court, the author appears to have invented a novel idea of bashing the Central Government, the State Government, the Police machinery so also judiciary and that was, prima facie, with a mala fide motive to interfere in the administration of justice. …The author has even gone to the extent of scandalizing and questioning the credibility of the higher judiciary by giving examples of the orders of bail granted to “Babu Bajrangi”, “Maya Kodnani” and “Amit Shah”. Arundhati Roy said she will respond to the order in court. This Ashutosh Bhardwaj article from Indian Express is at least five months old (its a general page, so no date), but is maybe worth a look since a few people recently have mentioned the Maoist struggles of the 1960s and 1970s. The continuities between then and today are convoluted, but they exist. In Chhattisgarh, over 50,000 CRPF, BSF, ITBP and state police personnel are fighting the Maoists, but politicians and officials still cannot enter many areas. Five Maoists were arrested in the southern peninsula this month, and Home Minister Rajnath Singh said last week that incidents of Maoist violence were on the decline. How relevant is that claim? ASHUTOSH BHARDWAJ answers key questions on the activities of the CPI (Maoist), both in its forest strongholds and clandestine urban bases, and gives a status report on its operations. Is the CPI (Maoist) on the decline? Compared to the 2006-2010 period, attacks have been fewer in the last two-three years. But they remain entrenched in the forest zone across central India, and dominate a far wider territory in Dandakaranya now than they did in 2004, when the MCC and CPI (Maoist) merged. In Chhattisgarh, over 50,000 CRPF, BSF, ITBP and state police personnel are fighting the Maoists, but politicians and officials still cannot enter many areas. 2014 is considered among the calmest years in a decade, but it was also the year in which the CRPF suffered its second biggest casualty in a calendar year in Chhattisgarh. According to Home Ministry figures, from 2008-14, 992 LWE cadres were killed, 13,657 were arrested, 2,608 surrendered. But the data does not distinguish between CPI (Maoist) and other groups, several of which are active in Jharkhand. What is the Maoists’ urban network? Underground cadres who operate from cities, sympathizers and supporters. Maoist documents stress on building a strong base in cities, and mention three kinds of urban mass organisations: secret, open and semi-open, and legal, the last including cover organisations and affiliated activists. The forest-based rebellion survives mostly on what Maoist ideologue Varavara Rao calls the “movement in urban areas”. From the urban network come logistics, moral and intellectual support, and the ideological argument for violence. The network is in several cities, and sympathisers occupy prominent positions. Central Committee member Malla Raji Reddy’s daughter Snehlata and son-in-law C Kasim live on the Osmania University campus in Hyderabad. Kasim teaches Telugu, Snehlata edits a journal on revolutionary politics. “We support the Maoist movement, the only path available for the poor and oppressed. There have been setbacks but the movement will go on,” says Kasim. How does the CPI (Maoist) operate? A mammoth hierarchical structure operates on a ‘need to know’ basis. At the top is a 20-member Central Committee headed by Muppala Laxmana Rao or Ganapathy. Other CC members include Nambala Keshava Rao or Ganganna who heads the Central Military Commission, military expert and Giridih resident Misir Besara, and Dalit Maharashtrian Milind Teltumbde whose brother is married to the sister of Prakash Ambedkar, the grandson of B R Ambedkar. Under the CC are four regional bureaus, the most significant and active of which, the Central Regional Bureau, is headed by Katakam Sudarshan alias Anand. The CRB has three units: Dandakaranya Special Zonal Committee, North Telangana Special Zonal Committee and Andhra Orissa Border Special Zonal Committee. Slain leader Kishanji’s younger brother and CC member Mallojula Venugopal Rao or Bhupathi is in charge of the DKSZC, the headquarters of the CPI (Maoist), and home to some of the top leadership. CC member Akkiraju Haragopal, who led the talks with the YSR government in 2004, is in charge of AOBSZC. Its secretary is Modem Bala Krishna, also a CC member. CC member Pulluri Prasad Rao alias Chandanna heads the NTSZC. The North Regional Bureau comprises units in Delhi, Punjab, J&K, Himachal, Uttarakhand and UP, and is mostly defunct. Zonal or state committees are divided into area committees, which form the Revolutionary People’s Council in villages. These have successfully replaced panchayats in many areas of Dandakaranya. What is their military capacity? Bastar has two major battalions, Jharkhand has a fledgling one. The South Bastar battalion, formed in 2009 and headed by Hidma, has the finest guerrillas and has carried out nearly all major attacks in recent years. The Abujhmaad battalion, headed by Ramdher, was formed in 2012 primarily to protect the top leadership soon after CRPF entered the area. Each battalion has formations of company, platoon and squad, but their numbers vary. Bombmaking capacity was hit after the head of the Technical Research Arms Manufacturing Unit Sadanala Ramkrishna was arrested in 2012. His aide Deepak Parghania, an award-winning technician from SAIL’s Bhilai plant, was arrested too. Units in Karnataka, Tamil Nadu, Bihar, Jharkhand and Andhra manufacture artillery, rifle parts, pressure mines, rocket launchers. Are there any fissures within? Over the last decade, several senior cadres have questioned the preeminent focus on violence, to the exclusion of mass awakening, building bases in universities. Public executions in Jan Adalats have earned the wrath of tribals in many cases. “They are leading a necessary movement, but they need to review their violence,” surrendered CC member Lanka Papi Reddy has said. Former DKSZC spokesperson Gudsa Usendi alias Sukhdev has voiced reservations against highhandedness by cadres. Of late, the Maoists have issued several apologies for attacks. Where has the state failed? A democratic state functioning within the Constitution and law has a fundamental handicap in dealing with the challenge. There have been no killings in Andhra and Telangana of late, but teachers, writers and journalists in cities from Warangal to Guntur feed the movement many ways. Seminars in Hyderabad celebrated the 10th anniversary of the CPI (Maoist) last year. Spokesperson Azad lived in Delhi for years with his wife. There are enough disillusioned youth who are attracted to their ideology, and to the lure of the gun and romance of a forest life. In the end, the state must be able to demonstrate that the political system is not just for the moneyed, manipulative and powerful. Dr, G N Saibaba, Delhi University Professor, who has been in incarceration since 9th May, 2014 has commenced an indefinite hunger strike from 11-04-2015 demanding proper medical treatment and food, both of which are being denied to him by the authorities of the Nagpur Central Prison. 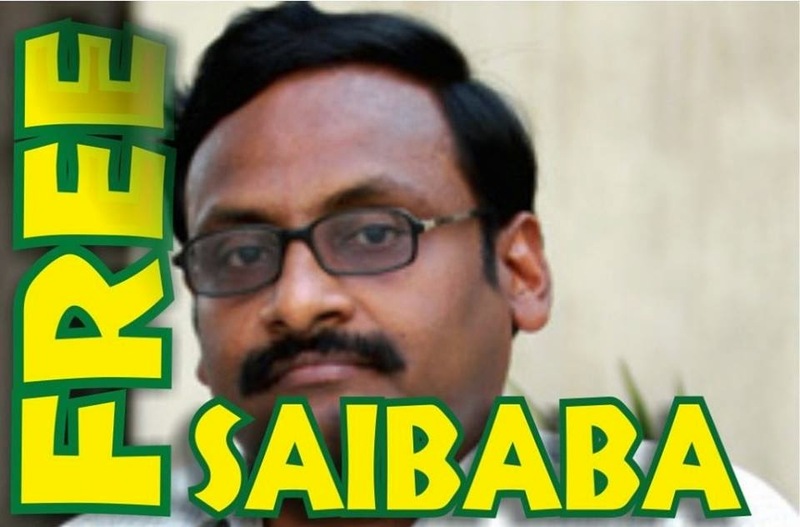 Dr. Saibaba, who is presently lodged in the notorious Anda Barrack of the Nagpur Prison has been denied bail twice by the Sessions Court, Gadchiroli and once by the Nagpur Bench of Bombay High Court. In the last order by the Sessions Court dated 4th March, 2015 the Sessions Judge referred to the reports of the Superintendent and the Chief Medical Officer of the Nagpur Central Prison which, while admitting the delicate medical condition of Saibaba, stated that he was being treated at the Government Medical College Hospital as well as the Super Speciality Hospital in Nagpur and that they were providing food supplements as per his medical requirements. It was on the basis of such reports that bail on medical grounds was denied to Saibaba. However, despite such claims by the prison authorities made before the court, the prison administration has not only continued to deny him proper medical treatment and food supplements, but also now even stopped certain items that were earlier allowed to him. Faced with a situation of a steady deterioration in his health condition, Saibaba has decided to protest and has completely stopped taking food from Saturday. His lawyers, who met him on Monday, 13th April, 2015, immediately submitted a memorandum to the DIG (Prisons) East Region, the prison authority under whose jurisdiction the Nagpur Prison falls. The official however merely received the memorandum and refused to respond to the issues raised by Saibaba. He did not even indicate any willingness to allow the essentials that the prison report to the court has stated that they were providing. Immediate action is called for to protect the life of Dr. G N Saibaba and obtain his release. I expect the #commodity system people I was lecturing about today may have planned to leave this perfect trinketisation item in the supermarket I frequent these days – I’d not seen it before now, but for sure it’s the real thing, eh. Click on the pic for more.